This 6 inch white bear is ready to make your day better. It’s holding a red heart with HUGS written across it. The heart is done in a stiffened felt to make it sturdier. This little one has a red ribbon tied around its neck and red pads on its paws. 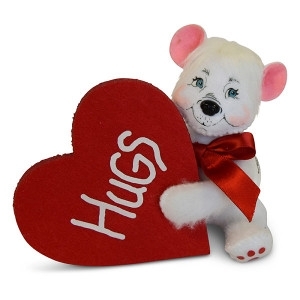 Cute item to give to a special someone in your life no matter the occasion.